The first half of this class is about keeping two databases synchronized. Perhaps you have an office database and a copy on your laptop - you want to keep them both in synch. We will begin by talking about database replicas and why I don't like them. So we'll write code to handle this ourselves. 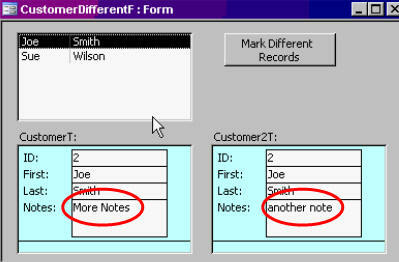 We'll make two different customer tables, and have our VBA code detect any changes between them - either different or new records. We'll create a form with two subforms so you can see changes between the tables. This would happen if, say, you changed the database on your laptop and someone else changed the office database at the same time. Now you have a conflict to resolve. We'll make a button to bring any changes in customer table 2 into customer table 1. We'll also make a button to import any NEW records that were added. Now we'll move ahead to student attendence. We'll make a simple student table. Then we'll make a form with a mult-select listbox on it so we can select the students that were absent, enter the date, and then with one click mark them all absent. You'll learn how to determine which days are weekend days. We'll also make a table with allowed school holidays, so we can exclude those from our date calculations when figuring out how many days students have missed. Knowing this, and what the first and last days of school are, you'll be able to calculate the number of days each student was in school. What Does Unmatched Wizard Do? Harry Mullin on 3/27/2009: You mention that START OF SCHOOL YEAR is in UC because "we are going to look for it in code". Does setting the case help the speed of DLookup? Case doesn't seem to make a difference in the where clause of dlookup. Have I missed something? Harry Mullin on 3/28/2009: Note on the DaysAbsent query: the nz function has an additional parameter which can be used to specify zero. Left off, it returns nothing. works to avoid the isnull workaround. for DaysInSchool just to see what would return. Harry Mullin on 3/28/2009: What is the distinction among Refresh, Requery, and Recalc? Richard Rost on 4/1/2009: Harry, what's the time index? Nothing in Access is case sensitive. I might have just done that to make it easier for YOU to see it in the code? Richard Rost on 4/1/2009: Harry, you are correct. I'm used to working with NZ in VBA code, not queries. In VBA code, the DEFAULT value of that second parameter is ZERO if you're working with a number type (such as an ID) otherwise it's a zero-length string. MOST of the time I'm working with NZ it's for looking up IDs to see if records exist, so you don't need to specify it. From Microsoft's Help: If the value of the variant argument is Null, the Nz function returns the number zero or a zero-length string (always returns a zero-length string when used in a query expression), depending on whether the context indicates the value should be a number or a string. If the optional valueifnull argument is included, then the Nz function will return the value specified by that argument if the variant argument is Null. When used in a query expression, the Nz function should always include the valueifnull argument. So, ideally, when working with queries, always make sure to specify the zero. Thank you, Harry. Kenneth Lange on 11/28/2010: Thank, Richard! I had been Wondring & pondering How I could use one form for Multiple uses. You demonstrated that to me it Access 325, video 2 at approx timestamp 9:34; Comparing & Syncing 2 Tables! Many Thanks to aGreat Instructor!!! It seems there is an error at time index 3:42. Perhaps you could try out and see. Otherwise, i am happy with the video. As i follow this video, i am using an external db. I need to create a query that will pick fields from both the external and the current db...such that i can import the new records. How can i do this? I cant figure it out yet.